There are many definitions of internal power. These definitions change based on the specific martial art practice to which it is applied and range from the ability to withstand blows to the body to the power to pull a truck from rope attached to one's nether regions to the ability to effortlessly toss an opponent across the room. 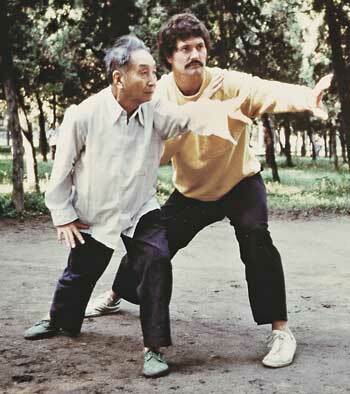 The late master, Liu Xing-Han teaching the author the finer points of Ba Gua Zhang in Beijing, at the Temple of Heaven Park, 1988. 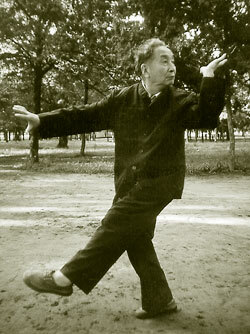 The author's late teacher, Liu Xing-Han demonstrates the exercise around the time of his 86th birthday. Internal power as described here refers to a specific kind of martial art skill associated with the nei chia chuan "internal martial arts." In this definition of power, the movement is "soft" and "gentle," like the Chinese word that describes this power, an jing, literally, "peaceful power". In this power no torqueing is involved and anger is antagonistic to the ability to manifest it. This type of internal power is associated with intent and derived from a practitioners inner peaceful state. It is brought to fruition from a type of inner harmony derived from an ordering of ones subtle biological systems. This power is epitomized in Li Yi Yu's instructions to late nineteenth century Tai Chi practitioners: "Use the Mind and not Force" and use only "Four Ounces of Force to defeat a thousand pounds." Internal power in the Chinese internal martial arts was a by-product of three different influences. One of these influences is Daoist yoga. From the ancient Chinese dao yin yoga the first internal martial artists adapted ways of moving in order to harmonize mind and body with the flow of Qi  energy. The second influence was the Daoist philosophy itself. Here notions of using "softness" to overcome hardness became more than political or social philosophy. In this application Daoist principles of yielding and becoming water-like transformed from lofty ideals into principles of training and strategies to conquer an opponent. The final contribution to the development of this brand of internal power were the martial art antecedents contributing to efficient close combat. Principles such as holding the spine erect and not becoming "double weighted" were expanded by exponents such as Wu Ch'eng-Ch'ing  who was the first author on a "Push Hands" training manual. Representing this rare way of learning how to conquer an opponent, students and teachers are faced with a dilemma. This challenge has to do with getting the right balance between two poles. The two poles are 1) The physical mechanics and principles of the art and 2) Sensitivity and "soft" internal principles of the nei chia chuan "internal boxing." This is an arduous challenge. Overemphasize the mechanics and the art becomes robotic. Overemphasize the soft internal methods, and the student gains little more than the ability of a soggy noodle. The right balance between both poles are necessary to fully express internal power. The first pole involves physical mechanics. It applies the real, concrete and mechanical to the internal arts. This aspect involves: 1) Learning efficiency and mastering hidden (unseen) leverage, 2) Attaining root, the art of optimizing strength and effect by correct alignment in relation to the ground, and 3) Learning to release, instead of forcing or pushing power (similar to the way a star pitcher throws a baseball, a practice involving a totally interconnected spring-like release). These are all very important, but only one side of training. The other is more hidden from normal view. It concerns itself with being aware of and directing the Qi. In general, those who have been most successful in internal martial arts start with the development of sensitivity. This sensitivity has to do with both inner and external awareness. Their training begins by learning to become aware of subtle changes within their own body. Then focus is directed to energy fields outside their body and finally learning to become sensitive to the energy fields of others. This sensitivity leads to the ability to use soft and relaxed methods in a real confrontation. There are various techniques used by internal masters to get students to attain this soft yet connected power. They all involve the merging of hardness and softness, of stillness and movement: the blending of the two poles. 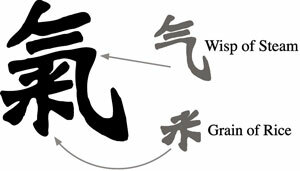 One of the best places to look at the key to this merging of the poles of physicality and internal energy is in the principle of loose and connected power as represented by the Chinese word "sung." Sung is the merging point between the hard and soft. Its hardness is the manifestation of the power of a spring-steel whip delivered with minimal effort. Its softness is the ability of the whip to adapt, manipulate and express power through its fluid-like, changing medium. The Daoist yogas, or Dao Yin , are among the best ways to merge physical form and internal energy. However the nexus where structure, form, mind, will and energy merge is delicate and the process of integrating this knowledge with physical form requires the lightest touch. By lightness, I am speaking of mental and physical aspects in respect to both healing and martial arts. Lightness of touch moves energy and Will through physical form in refined ways. The presence of this quality indicates lessening of the influence of the grossly physical in favor of sensitivity and refinement. Sensitivity and refinement of the nervous system indicate the tenuous merging of mind, will, and structure. An adept, by applying this principle, manifests skill as a slight touch that has a lot of effect in throwing, off-balancing or demonstrating power. A by-product is a profound effect on the practitioner's nervous system; an attribute that speaks to the arts of the yogi and leads to the development of a heightened and specialized control of the nervous system. With experience, these skills will extend beyond the physical boundaries of the practitioner, who intuitively becomes increasingly able to sense and adapt to minute changes in an opponent's energy flow, structure, position, and even intent. For internal arts to maintain their relevance and meaning for the future, the true essence of the art must be revealed to the next and the next generation. This is best done with eliminating the tendency to be drawn too far toward either the pole of physical mechanics or that of sensitivity and internal energy. Three ways that might be helpful in blending of the poles are 1) finding the secret of "sung,"  2) by incorporating Daoist yoga into one's training, and 3) by learning to produce power and effect through lightness of touch. My hope is that the development of internal energy will have social benefits and will contribute to the evolution of mankind. This entry is an adaptation of John Bracy's "Finding Qi in Internal Martial Arts," which appeared in Qi Journal, Summer 2002 issue. ^ Many today take the concept of inner qi as the most central concept of Chinese yoga, traditional medicine and the internal arts. Inner qi (In Chinese nei qi, literally "internal energy") was developed within Daoist internal alchemy traditions in the middle of the Tang Dynasty (618-906 CE). At that time it began to be described by some Daoists searching for the secret of immortality as the animator of the mind and body's interior change. In terms of internal arts, the doctrine of internal qi is most important. It is the basis of how we, in the internal healing and martial arts, think of qi today. It has become the underlying assumption in multitudinous mind-body health disciplines, especially in disciplines of taijiquan, qigong, Daoist meditation and Asian traditional healing arts such as acupuncture. All of these use various methods to get in touch with, develop, or balance internal qi. ^ Tai Chi stylist, Wu Ch'eng-Ch'ing is described by martial art historian Douglas Wile as "an active participant in the formulation of theory" and author of the first "Push Hands" training manual. See Wile, Douglas, Lost T'ai chi Secrets from the Ch'ing Dynasty. p. 41. ^ [note: "Sung" is also written as "Song"]. It commonly means "loose" or "relaxed". Within the internal martial arts it represents "springy-ness" or "tenacity" like the resilience of bamboo. Qi as internal power, is largely explainable by the relaxed yet tenacious, 'springy' power of song." See "Mechanics of Power in Ba Gua" by John Bracy in Pa Kua Chang Journal, vol. 6, no. 6 – Sept/Oct 1996. John Bracy. Ba Gua: Hidden Knowledge in the Taoist Internal Martial Art. [especially pp. 5-20]. North Atlantic Books, 1998. John Bracy. Internal Power in the Martial Arts part 1: "Neutralizing Force", [DVD]. Wang Xiangzhai. Essence of Combat Science … an interview.